I like to call this one my “Great Day Dressing” because while it’s super simple to make (and also really versatile), the addition of champagne vinegar just makes it feel special, and it can brighten up even a difficult day. Try this over green salads, grain bowls, grilled meats (or tofu!) or even pasta dishes. 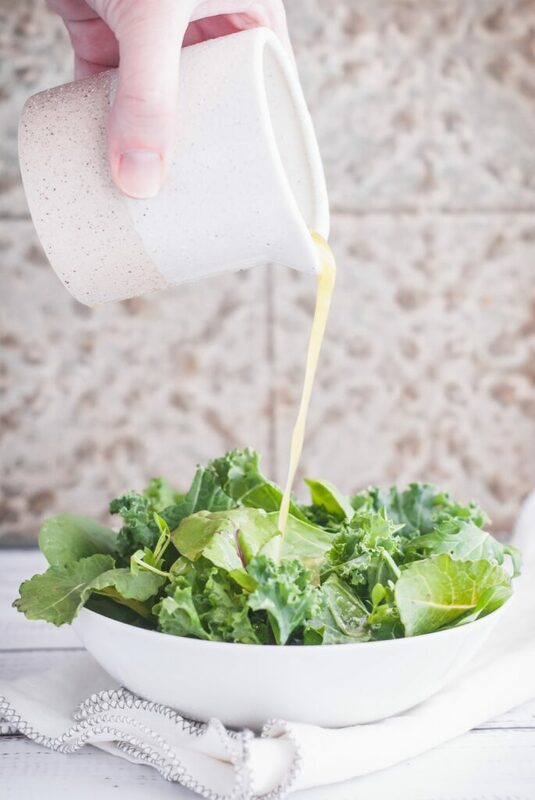 You can make a batch of this dressing and store it in the fridge to use all week. As I’ve been doing more plant-based eating, my appreciation for a good dressing, sauce, or dip has grown immensely. They have the ability to turn any ordinary bowl of vegetables and grains into a tasty meal. 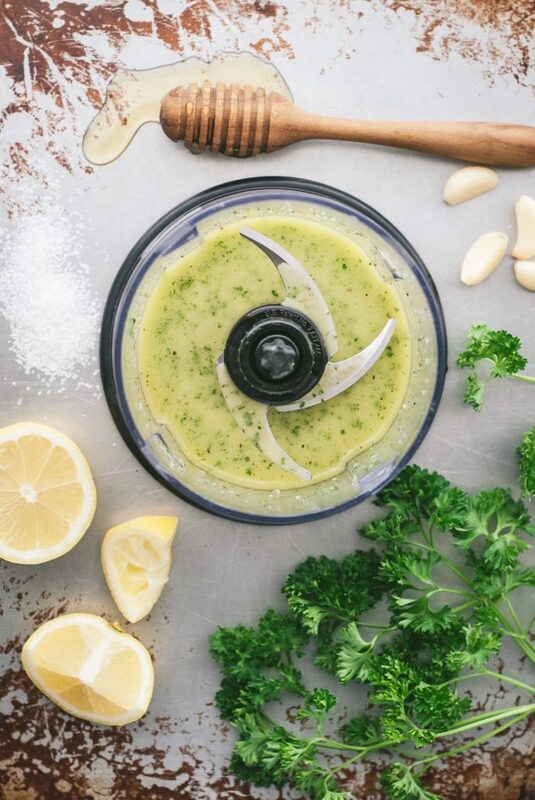 Some of my favorites include magic green sauce, mmm sauce, and this kale pesto. Once upon a time the idea of making my own sauces and dressings seemed time consuming and not worth it, but now I know the 5-10 minutes it takes to whip up a sauce can mean delicious lunches all week long (and a bonus is knowing they are free of preservatives and other unpronounceable ingredients). 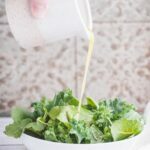 This dressing with champagne vinegar, honey and lemon has quickly become one of my favorites, especially with spring weather on the horizon. It’s fresh and flavorful with enough zest to transform even the most dull bowl of brown rice. It brightens up salads and is great to drizzle over grilled white, flaky fish. 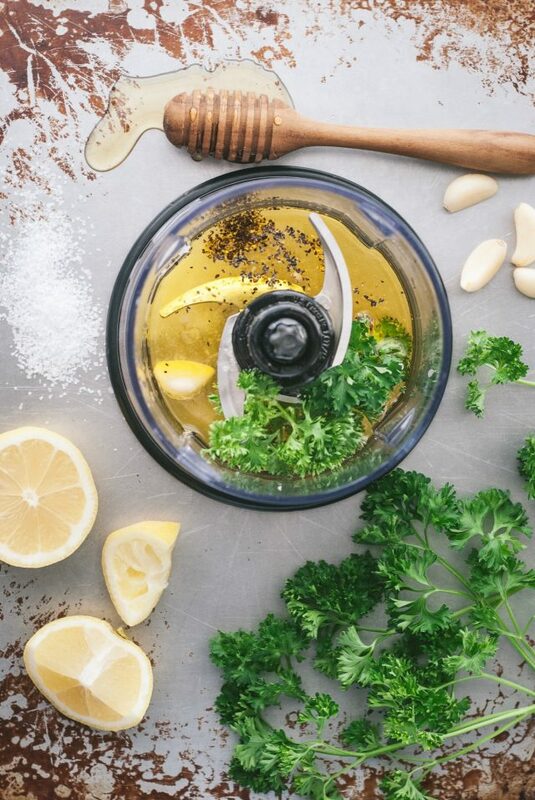 Bookmark this to blend up on your next food prep day. It only takes 5 minutes and has the ability to take your lunches from bland to BOMB! 🙂 Enjoy! Combine all ingredients in the container of a blender or food processor. Pulse until well combined. Cover and keep in the refrigerator for up to a week. Drizzle over green salads, grain bowls, grilled meats, or pasta dishes. If oil hardens when stored in the fridge, heat for 10 seconds in the microwave. If dressing separates when stored in the fridge, stir vigorously with a fork to re-emulsify. What exactly IS champagne vinegar?? Does it have champagne in it? I’ve never heard of it! Is it sold in most grocery stores? It truly is a vinegar derived from champagne! I found it at my local grocery so I think it is available at most! This is interesting. It is my first time to read about champagne vinegar. Will try to check if this is available locally. Thank you for sharing about it.